When planning your company’s event or trade show booth, there are so many details to coordinate that flooring may seem like the least of your worries. We get it - when the exhibition company or venue offers you the option of renting their basic event carpet, it sounds like the easiest option. 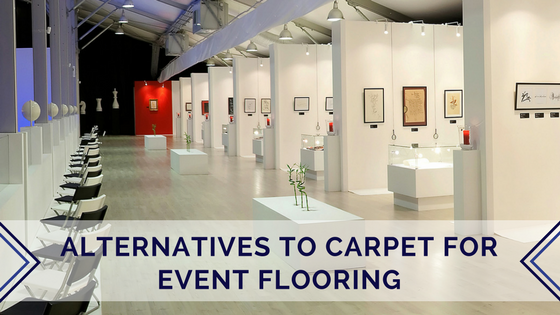 But, it is sometimes worth looking into alternatives, since the right flooring can be the final touch that really ties your event’s aesthetic together. While still technically in the carpet family, carpet tiles offer an alternative to the typical carpeting that your event venue or exhibition company can provide. They are lightweight, portable, and easy to install, making them a good option for companies that would like to purchase event flooring instead of renting it from a vendor. Carpet tiles are also almost always padded, making them a comfortable flooring surface for company representatives and event guests to stand on. Carpet tiles come in a wide variety of colors, allowing you to create a solid or patterned flooring surface to fit your event’s aesthetic. Some companies even offer carpet tiles with custom inlays so you can include your company’s branding on the flooring. We’re seeing more and more customers choose vinyl flooring for their events and exhibitions, particularly in Europe. Its smooth, flat surface gives any event a clean and streamlined look that can be a welcome alternative to the typical plush carpet. Vinyl event flooring can come in an enormous range of colors and patterns. Some vendors can even print your company’s logo on vinyl flooring. It can come in large rolls or in the form of Luxury Vinyl Tiles (LVT). Typical event LVT is a simple black or grey, but your company could choose to go with a higher-end LVT that looks hardwood, stonework, or another type of flooring for a fraction of the cost (and the weight) of the material it’s designed to look like. Another advantage of vinyl flooring is that it’s very easy to clean since it can just be wiped down or mopped. This allows it to be used more frequently than carpet that will fade over time as it is washed over and over again with harsh chemicals. The downside of vinyl flooring is that it has linear expansivity, meaning that it will expand and contract with temperature changes. So, while it may look great when it’s initially laid down, it could wrinkle and bubble as people enter the event space and the room heats up. Luckily, this is an easy problem to solve - it just has to be installed with a full coverage adhesive. Obviously, exhibition hall carpeting is not an option for outdoor events. There are two types of flooring we see most often at outdoor events: astroturf and more heavy-duty materials, like Brumark’s outdoor event flooring. 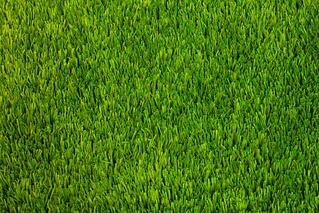 Astroturf is ideal for covering large outdoor spaces like parking lots, large fields, and the ground underneath the tent. It’s used for corporate events, golf tournaments, and other sporting events, among other issues, and is great because it protects the ground underneath from heavy foot traffic. Other, more industrial-looking flooring options are available for heavy duty installations, like situations where a car may be driving over turf or where there’s a walkway that will need to support a very large number of people. 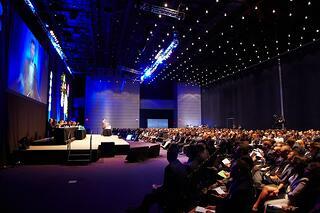 Should You Choose Carpet for Your Event? Of course, sometimes carpet is the best option for your event. There’s a reason it makes up almost 90% of the event and exhibition industry’s flooring! With different colors, weights, and levels of padding available, there’s almost certainly a carpet option to fit your needs. When it comes to event flooring, there’s no “best” option for everyone since each event and exhibition presents its own aesthetic and set of needs. If you’d like to discuss event flooring or installation options, please contact one of our product specialists.